There are two practical ways by which commutation may be improved. These methods are, 1. Resistance commutation and 2. E.M.F. commutation. In this method of improving commutation, the low resistance copper brushes are replaced by high resistance carbon brushes. From the Fig. 1 it can be seen that the current I from coil C when passing through commutator segment ‘b’ has two parallel paths. One is straight from ‘b’ to brush while the other is through short circuited coil B to segment ‘a’ and then to the brush. By using low resistance copper brush the current will not prefer second path as it will prefer first low resistance path. When carbon brushes having comparatively high resistance are used then current I through coil C will select the second path as resistance of first path will be increasing due to decrease in contact area of ‘b’ with brush and resistance r2 of second path will be decreasing due to increase in contact area of ‘a’ with brush. 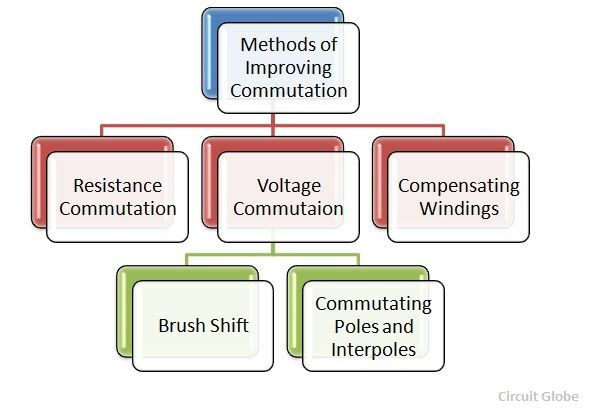 Thus by increasing contact resistance between commutator segment and brushes, will limit short circuit current and reduce time constant (L/P) of the circuit which will help in quick reversal of current in the desired direction. 1) Upto some degree they are self lubricating and polish the commutator. 2) If sparking occurs, damage to commutator will be less as compared to when copper brushes are used. 1) There is a loss of approximately 2 volts due to high contact resistance. Hence this is not used in small machines. 2) If carbon brushes are used the commutator is required to be made somewhat larger for heat dissipation without rise in temperature which is not necessary for copper brushes. 3) Larger brush holders are required due to lower current density (about 7-8 A/cm). The method in which reactance voltage produced is neutralized by the reversing e.m.f. in short circuited coil is called e.m.f. commutation. If the value of this reversing e.m.f. is made equal to reactance voltage, the effect of reactance voltage will be completely nullified so that there will be fast reversal of current which will give sparkless commutation. There are two ways of proving e.m.f. commutation. If the brushes are shifted forward or backward depending on generator or motor, a little beyond to magnetic neutral axis, the short circuited coil will come under the influence of main pole of opposite polarity. This will partly neutralized the reactance voltage which will help in quick current reversal. This method is rarely used in practice as it will lead to many practical difficulties. This method is more suitable and actually used in practice. In this method reversing e.m.f. required to neutralize reactance voltage is induced in the coil undergoing commutation by using small poles fixed to the yoke and placed in between the main poles i.e. along geometrical neutral axis. These poles are called interpoles. Practically interpoles are placed in between the main poles, as shown in the Fig. 2. On these interpoles few heavy gauge copper wire turns are wound and these are connected in series with the armature. The polarity of an interpoles is same as the next main pole ahead in the direction of rotation and in case of motor it is same as main pole behind as shown in the Fig. 3. The brushes are kept along the GNA so that coil sides lie directly under the interpoles. The polarity of interpoles is same as that of main pole ahead, the induced e.m.f. in them helps the quick reversal of current. The e.m.f. induced in the interpoles is called commutating or reversing e.m.f. which will neutralize the reactance voltage making sparkless commutation. With interpoles sparkless commutation upto 20 to 30 percent overload with fixed brush position cam be obtained. Hence sparking limit is at same value as that of heating limit. So for given output the machine can be made smaller and will be cheaper than non-interpoles machine. Also by using interpoles automatic neutralization of reactance voltage at all loads is ensured since it is connected in series with armature and reactance and reversing e.m.f.s are proportional to armature current. Although interpoles mainly provide reversing e.m.f. opposite to that of reactance voltage, the other advantage of using interpoles is that they help in neutralizing cross magnetizing effect of armature reaction. As shown in the Fig. 3 OFf represents m.m.f. due to main poles whereas OFc represents cross magnetizing m.m.f. due to armature. The m.m.f. due to interpoles represented by OFi is in opposition to OFc so they cancel each other. Thus shifting of brush from original position is not required. Also automatic neutralization at all loads is ensured since armature field and interpoles are produced by same current.